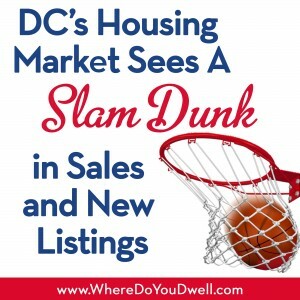 The DC Metro real estate market had its own version of “March Madness” with increases in sales, new listings and inventories. According to an analysis by RealEstate Business Intelligence (RBI), the March housing market achieved some new highs in several key measurements, demonstrating continued strength and confidence. Despite a slight drop in overall median sales prices for the region, prices are still above 5- and 10-year averages. This is good news for both buyers and sellers, helping to keep expectations positive as the spring selling season kicks off. March 2016’s median sales price of $399,000 was down a slight 0.3% (-$1,000) compared to last year, but up $19,000 (+5%) from last month. 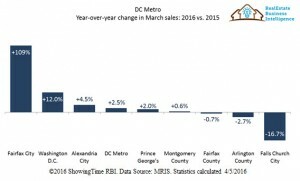 Sales volume across the DC Metro area was nearly $1.8 billion, up 1.9% from last March and up 32.3% from February. Closed sales in March of 3,755 were up 2.5% compared to last year, the 16th consecutive month of increases. The 6,165 new contracts increased by 11% compared to March 2015. New listings were up 20% year-over-year to 8,352, the highest March level since 2007. Active inventories rose 8.4% compared to March 2015 to 9,774. The increase in year-over-year inventory growth in March was the largest since October 2013. The average percent of original list price received at sale was 97.1% in March, the same as 2015. Half the homes sold in March were on market 27 days or less, up two days from last March, but down 17 days from last month. 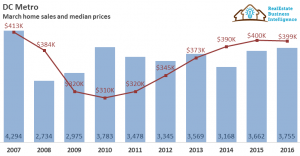 Home Prices — Price levels are now 28.7% above the March 2010 low of $310,000, and only 3.4% off the March 2007 peak of $413,000. March’s regional median sales price of $399,000 was a slight 0.3% lower than last year, with single-family detached and condo prices down about 1% but townhome prices up 1.5%. This marks the fourth month in a row that overall prices have declined year-over-year. Prices are 4.6% above the 5-year average and 9.2% above the 10-year average. Prices by Jurisdiction – Most areas experienced a slight dip in sales price compared to March 2015. Falls Church City remains the most expensive location in the region with a March median sales price of $806,000, while Prince George’s County continues to be the most affordable area in the region with a March median price of $234,900. 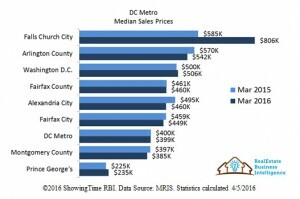 Only Falls Church City (+37.8%), Washington D.C. (+1.1%) and Prince George’s County (+4.5%) saw median price increases in March. Closed Sales – March marked the 16th month in a row of increased year-over-year sales. There were 3,755 closed sales in March, up 2.5% compared to last year and up 30.7% compared to last month. Single-family detached sales were down a slight 0.5%, while townhomes and condos were up 4.1% and 6.1% respectively. For the year-to-date, sales are up 5.7% compared to January-March of last year. March’s closed sales total was up 37.3% compared to the market low of 2,734 seen in 2008, but was 12.6% below 2007’s peak level of 4,294. Fairfax County had the most closed sales in the region of 1,083, a slight 0.7% decrease from last year. Pending Sales/Contracts – The region saw pending sales figures above the 5-year average of 5,556 and the 10-year average of 5,027. There were 6,165 new pending sales at the end of March 2016, up 11% compared to last year. All property types again saw increases in the number of new contracts compared to last year, with single-family detached up 13.6%, condos up 10% and townhomes up 7.5%. March 2016’s new pending sales number surpassed the March 2012 high of 5,671 by 8.7% and was nearly double the March 2008 low of 3,160. Prince George’s County, with 1,312 new pending sales had the largest year-over-year percentage increase, up 17.3%. New Listings — March experienced a 20% gain compared to last year, with all property types showing growth of about 20%. The number of new listings in March rose to 8,352. Compared to last month, new listings rose 61.5%, more than usual for this time of the year. New listings in March were 22.5% above the 5-year average and 14% above the 10-year average. The March new listings are 43.6% above the 10-year low of 5,817 seen in March 2013 and are only 10.4% off the March 2007 market peak of 9,317. All jurisdictions showed double-digit year-over-year increases in the number of new listings, with Washington D.C. the strongest at 27.3% and Fairfax City the weakest at 10.4%. Inventory – Washington D.C. had the largest increase in inventory of 21.9%, with 1,268 active listings. Inventories increased to 9,774 at the end of March, an 8.4% increase compared to last year and a 17.9% increase over last month’s level. Inventories are 13.2% above the 5-year average but 27.3% below the 10-year average. End of March inventories exceed the March 2013 low of 6,289 by 55.4%, but are down 60.7% from the peak of 24,855 seen in March 2008. For the January-March year-to-date, only Alexandria City (-0.2%) and Fairfax City (-13.95) show declines in inventory levels; all other areas are up. Average Sales Price to Original Listing Price Ratio — The region saw an overall 97.1% ratio, the same as last year and up from last month’s 96.7%. Over the last decade, the region’s March average sales price to original listing price ratio ranged from a low of 90.4% in 2009 to a high of 97.6% in 2014 and 2013. Homes in Falls Church City sold at 99% of their original listing price in March, the highest in the region and down slightly from the 99.4% seen last year. The largest gap between original listing price and sales price was in Prince George’s County, where the average ratio was 96%, down slightly from the 96.5% seen last year. Days on Market – Condos were the fastest selling properties, with a median DOM of 24. The median days-on-market in March was 27 days, a two day increase from the median DOM of March 2015, but down 17 days from last month. DOM are 4.9% below the 5-year average of 25 days and 40.5% below the 10-year average of 42. The lowest March DOM level recorded in the past decade was 15 days in 2013; the highest was 77 days in 2008. Townhomes had a median DOM of 25, with single-family detached at 31. In Fairfax City, the median DOM of 38 was less than half of what it was last year, but in all other jurisdictions, median DOM rose compared to last year, with the highest percentage increase in Arlington County, where DOM rose from 10 days to 18 days.